At this time of year, I am again reminded how much I have to be thankful for, and that includes the work I get to be part of at Resource Center. With your support, we accomplished goals that will benefit the LGBT and HIV communities for years to come. Thousands of people have been welcomed and received services at the new LGBT community center that opened on Cedar Springs Road in May – one of the largest in the United States. Just a few weeks ago, we completed renovations at the Health Campus in order to better serve individuals affected by HIV. We celebrate those milestones and the generosity that made it possible! With less than 30 days left in 2016, we are within $225,000 of completing the capital campaign for those facilities and programs. Please join in and spread the word about this last opportunity to have your name listed on our donor walls and to bragging rights that YOU helped make it possible. For more information and to support the closing phase of the Center’s campaign, visit myresourcecenter.org/campaign or contact Cameron Hernholm, Chief Development Officer at chernholm@myresourcecenter.org. 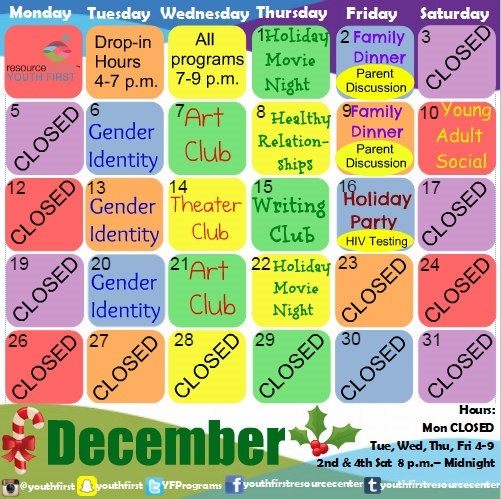 Wrap it Up for Resource Center through December 31! 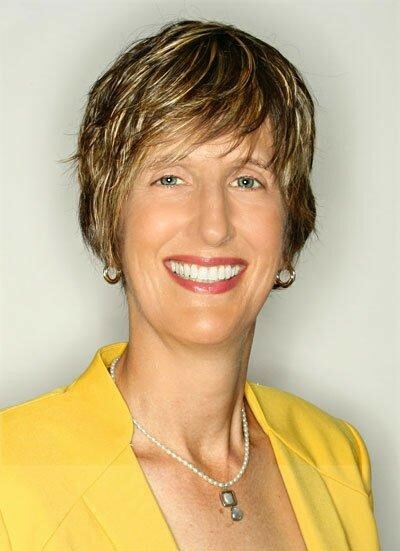 contact Cameron Hernholm, Chief Development Officer, chernholm@myresourcecenter.org. Sponsorship opportunities available for Toast To Life! 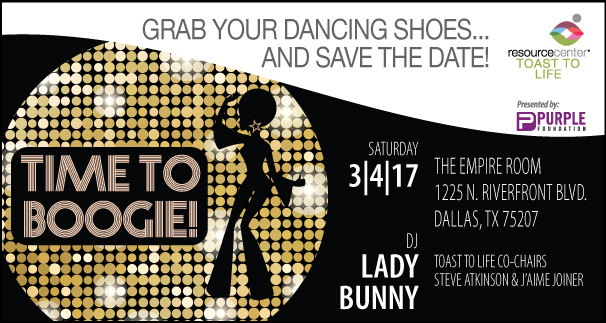 Please join us in support of the 19th Annual Toast To Life - Time To Boogie on Saturday, March 4, 2017 at The Empire Room. HIV Nutrition Program: The HIV Nutrition Program helps provide essential nutrition and basic food needs to HIV-positive individuals to decrease the debilitating effects of HIV and increase medical adherence. Last year, the food pantry and hot meals program served more than 240,000 meals to 2,692 people living with HIV. HIV Dental Clinic: The Center provides specialized HIV dental care to over 900 clients annually and is the only dental clinic offering HIV specialized services in Dallas County. Youth First: Approximately 15,000 LGBT youth live in North Texas, Youth First is the only local LGBT-focused youth program that addresses the challenges LGBT youth face with family members, peers and fellow students. Serving ages 12-18, Youth First equips young adults with the skills they need to lead an open life. Gray Pride: Healthy aging requires access to appropriate housing, quality health care and supportive public and private services. Such access is often denied to LGBT seniors because of discrimination based on sexual orientation and gender identity. Gray Pride is the LGBT-focused senior services program with a primary focus on combating isolation and improving mental health. Senior clients have access to Resource Center’s mental health. We hope that you will consider sponsoring this year’s Toast To Life. Ticket and sponsorship information is available HERE. 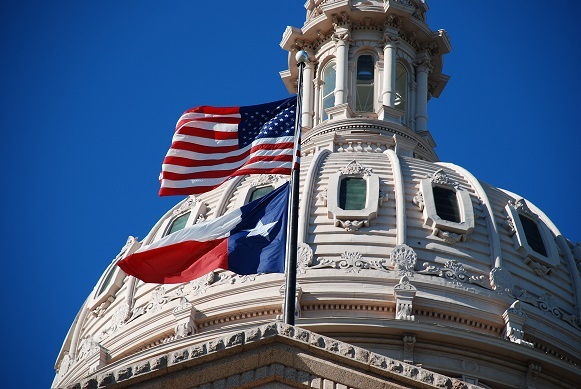 Manager of Resource Center, offers a few tips to redouble your commitment to defeating legislation in Texas that would seek to target LGBT Texans for discrimination: 1) Be aware of bills that will affect you and loved ones by checking the Texas Legislature online site. In recognition of Resource Center’s longtime leadership in caring for people with HIV/AIDS and the completion of its newly renovated Harold Simmons Foundation Health Campus, the Center held a grand opening celebration on Tuesday, November 15. The event included a ribbon-cutting ceremony, remarks from local dignitaries and guided tours of the facility. Among the speakers at the event were Cece Cox, Chief Executive Officer of Resource Center, Capital Campaign Chairman Terry Loftis, Dallas County Judge Clay Jenkins, and longtime community advocate, Penny Pickle Krispin. Other attendees included Dallas County Commissioners Dr. Elba Garcia and Dr. Theresa Daniel, Dallas County Health and Human Services Director Zach Thompson, DISD board member Miguel Solis and former City Councilwoman Veletta Lill. 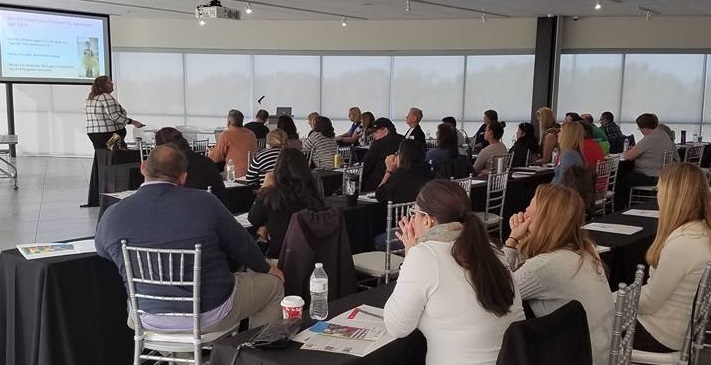 Resource Center, a United Way agency, operates the Community Center, Health Campus, Nelson-Tebedo Clinic, FUSE, United Black Ellument, Valor Latino and Youth First. For over 30 years, the Center has provided programs of interest to lesbian, gay, bisexual, and transgender (LGBT) community members and critical assistance to people living with HIV and AIDS and for their families. The programs of Resource Center promote understanding of the LGBT community and aim to eradicate the spread of HIV and AIDS. Copyright © 2016 Resource Center, All rights reserved.